Today, I came across quite a good find at my local newsagents. There was a magazine with a free die set for a nice, versatile owl building kit. If you have seen these before, you’d know how great they are. The magazine it came with shows at least 5 other animals that you can make with these dies, as well as some flowers. The only problem I had was that the blades were a bit deep, and even with the holes to poke the paper through, it was difficult, and I ended up pushing the needle tool through the card a couple of times. The bow on the finished owl, was a bow punch that I coloured with Copics and coloured pencils, before finishing with wink of Stella shimmer on top. 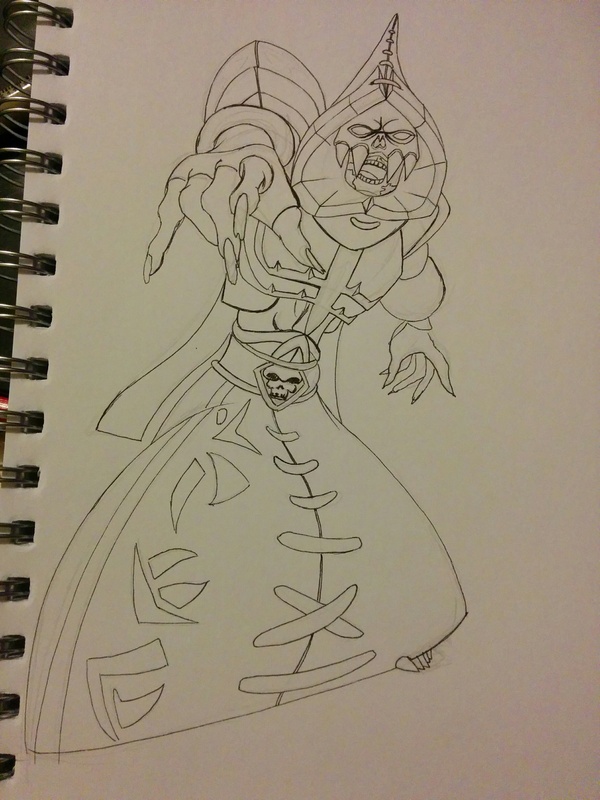 I might cover it with glossy accents if it finds its way onto a card or something. I seem to be running out of glossy accents, so I’ve been using is sparingly until I can travel to the shop again. I trialled the super fine embossing powder that I had bought online, and it was alright. It was rather transparent, and looked silver on the black paper that I tried it on. When I used white ink as a base for the embossing, it was brighter, but had much less details. It will certainly come in handy, but I would like to find a better brand. The one I bought was “Wow” white pearl superfine. 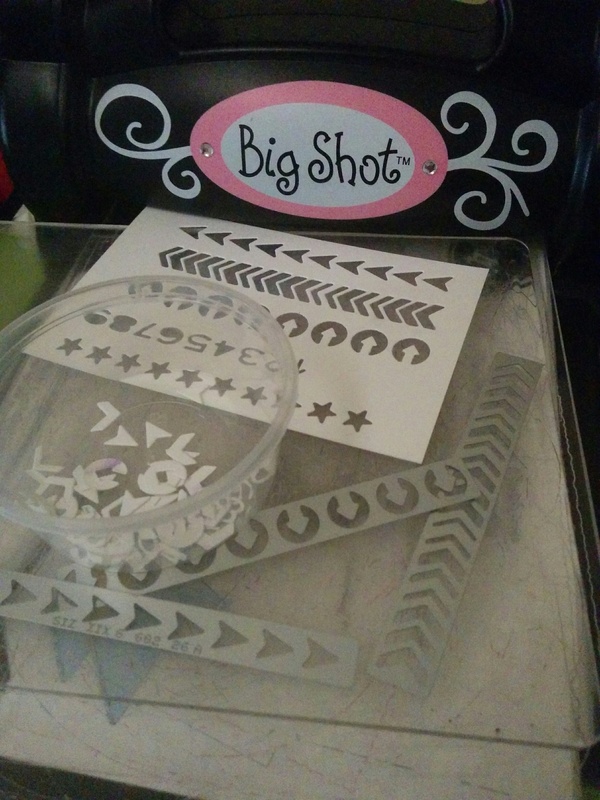 So I have some thinking to do, and see how many things I can make with my new dies. At some time over the past few years, I must have been very tired, as I began following a tumblr blog that is dedicated to pictures of cozy beds. They are nice to look at, and I found one that was completely white with a crumpled up sheet. 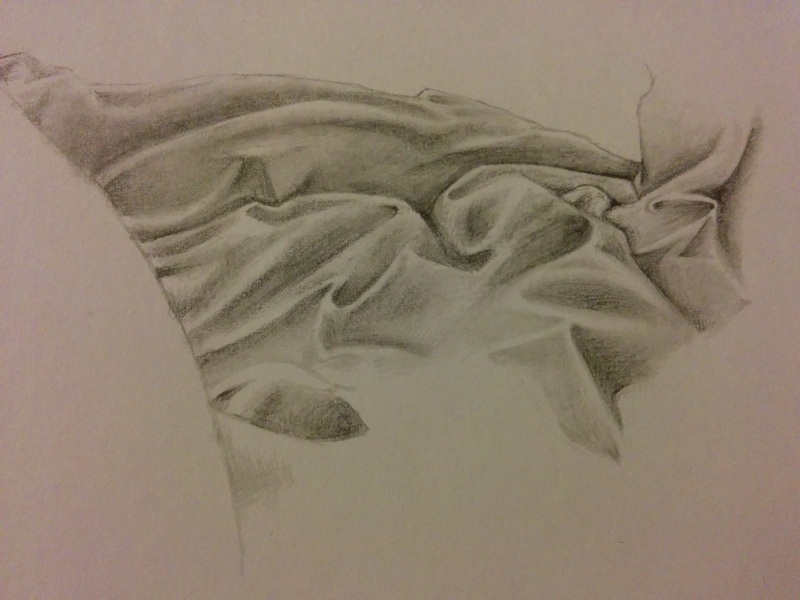 I immediately thought that it would make excellent practice for a white on white cloth shading exercise. It was nice spending some time on this. It had the calming effect of colouring, but exercising my drawing skills at the same time. I used my 6H (really hard pencil) to render in the shadows, as a light base, then used a much softer pencil, maybe a 2B for the dark parts. The harder the pencil is, the lighter the line it gives, and less graphite is left on the page. If the pencil is soft, the graphite leaves a lot more behind when drawing, making it darker, and doesn’t stay sharp for long at all. So this means, a 9H would be extremely hard and light, a 9B is very soft and dark. The scale begins at 9H, through to H (like 1H but it doesn’t have a number) then there’s a F, HB then into the B’s from B to 9B. The H stands for Hard, the B stands for blackness, and the F stands for Fine point. HB is usually a standard writing pencil that is used in schools, it is right in the centre of the scale, being dark enough to read, but not too dark that it’s hard to erase. 2B is often a recommended drawing pencil, as it is a bit softer, allowing you to get some nice contrast as you learn different pressures of shading. I’m unsure if this system is universal, as I’ve heard of the #2 pencil from America, but this is the way I know it. One of my favourite pencils is the 4B. It’s really dark and it’s hard to keep a point on it, but for days when you don’t know what to draw, you can produce some tattoo looking line art and block in colour easily while just doodling. You certainly don’t need the whole range of pencils, maybe just one you like. You can usually try them out at the shop. 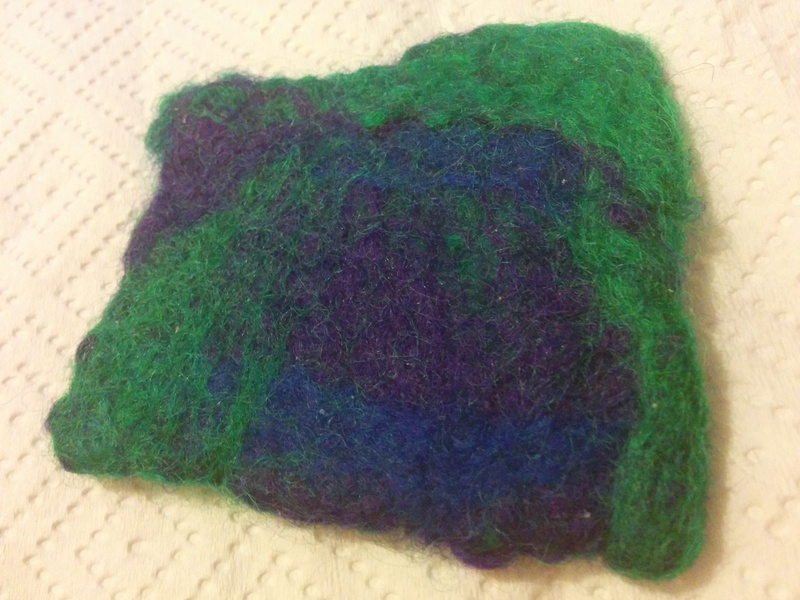 This is my first attempt at wet felting. It went alright, but might need a bit more work. For some reason it made my skin peel from my hands, so either I’m sensitive to something, or it’s the best exfoliation treatment around. I could only make a small piece, as it’s a bit expensive for me to buy wool at the moment, but I wanted to trial it. I don’t think doing this is large quantities would be fun, as it takes a lot of physical work, which I’m not able to do in excess. 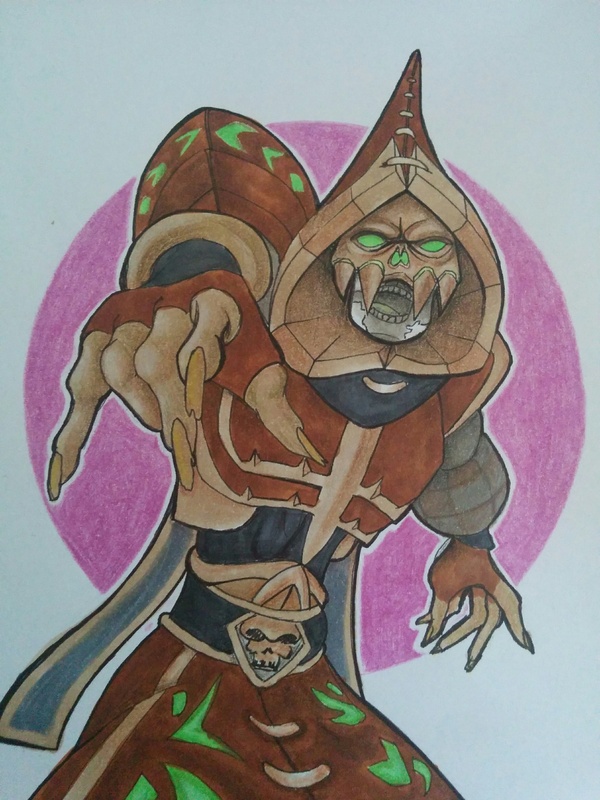 I coloured in my picture today, and was pretty happy with it, so was my partner, so he wanted it as a profile picture. I scanned it in, and the colours were off as well as the shading went all blobby. I probably set the DPI too high on the scan, but it is annoying. I’m contemplating redrawing it on the tablet, for his avatar. I didn’t do too much else, apart from a bit more loom knitting, although my list of things to do is starting to grow again. This time, I received a die set, and some superfine white embossing powder, that I bought. I haven’t gotten to trying out the embossing powder, as I don’t really want to use the heat gun while we’re in a heat wave. I’m actually surprised that it hadn’t heat set itself in the post, hehe. 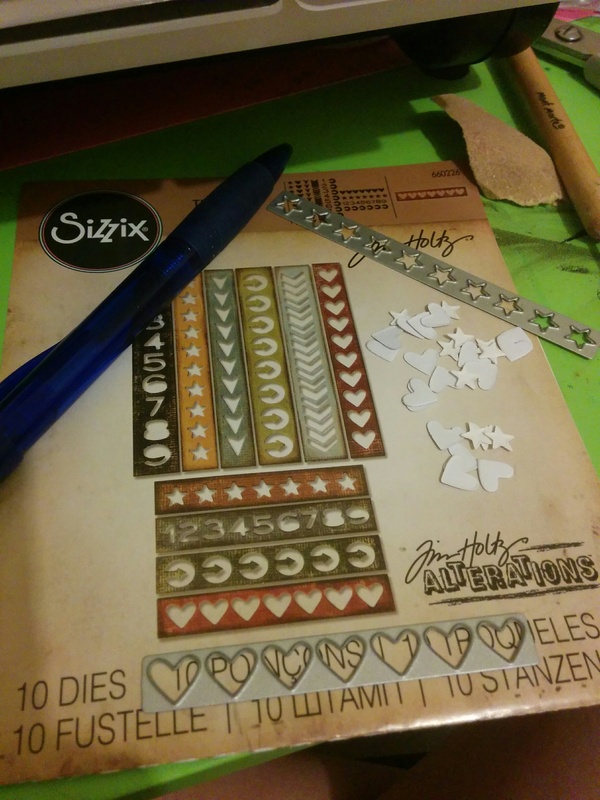 I was looking for a die set that made small hearts and stars, preferably in the same set, with multiple dies, to save time. I spent so much time looking through three different online stores, trying to find one that would be suitable. Just when I was ready to give up, I found this die. It’s originally to make a line of cutout shapes for border like strips, but the pieces that come from it are perfect for tiny embellishments. This set comes with ten dies, including hearts, chevrons, stars, numbers and two types of arrows. Six of the dies come vertical, and the rest in a horizontal layout, making them more versatile for your cards. You can use either the positive or negative shapes on your projects, and they don’t cut out the edge of the strip, so it can be put anywhere on the page when you run it through your machine. This would look great paper pieced together, with different colours creating a custom strip for your piece. Now, I have a few things to go try before I start sounding more like an advertisement. I just really like this die set. Now, I really like this one. I wasn’t sure about the pose, and thought the eyes and nose would look weird, but I kept with it, and once it was inked, I really liked it. I was reading up about finding your own style in art and drawing, and the one thing that stood out and stuck in my mind was ” finish for the sake of finishing.” So, even if you aren’t sure about how it looks, don’t give up on the picture. Sure, you can erase and change bits, but sometimes you need the small feeling of accomplishing something to keep you going. Incase you haven’t noticed, I’m not one to finish projects, and that takes a big toll on my view of my abilities. Sure I have talent, but if I never finish things, what’s the point, I can’t sell half done projects and I’m surrounded by them. So this is one thing that I really need to focus on. Maybe I can start by making smaller projects, and working my way up. This should help with self esteem and give a more positive view when I begin things. Quite like this piece, though it has plenty of room to improve. Last week, in the mail, I received some fineliners that I had ordered online. Apart from being cheap, the description said they were waterproof, archival ink, so I was excited. They are lovely pens and range in 7 sizes between .005 and .08mm, however, they don’t appear to be waterproof at all. I discovered this after I had used my good paper, sketched and lined an original drawing and began putting down a base coat of watercolour. It only got on part of her ear to begin with, so I just made sure I was extra careful, and using coloured pencils for any shading. Some bleeding occurred, but not to ruin the entire image. I didn’t really plan much, so the hands look slightly awkward. Maybe could have done with a prop or something. I was inspired by a fanart picture of Ariel, which is why her hair is so flowy, but wanted to change the colours and pose, so you wouldn’t even recognise it. I like cutting off the bottom of the figure with the circle, as sometimes you want to focus on the head and torso region, like a portrait. It adds a little bit of dimension, too. I think she looks like Buffy the vampire slayer wearing yoga pants. Gah. Looks wonky now that I look at it at a distance. Need more practice. Today I discovered an artist named Genevieve Kay. She has a few videos on YouTube and a lovely website for her illustrations as well as a tumblr. 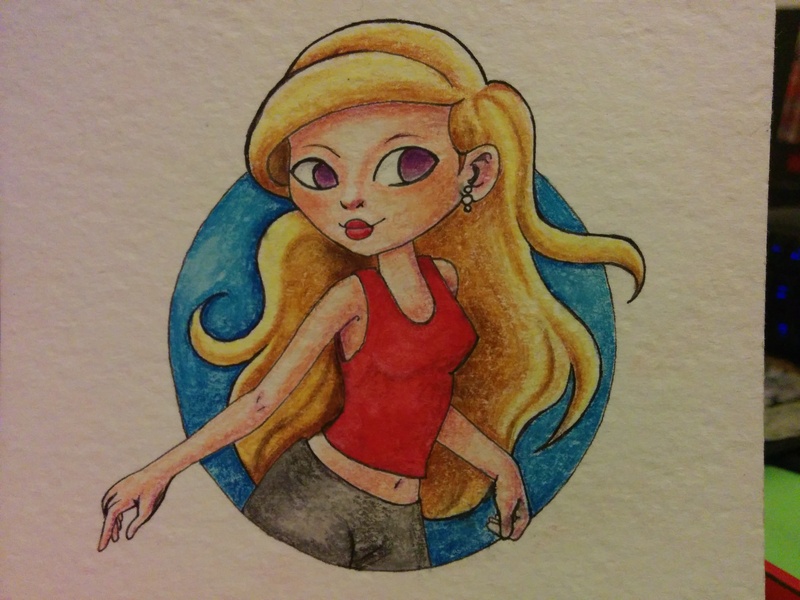 She does a lot of fanart of mainly Disney, but not exclusively. 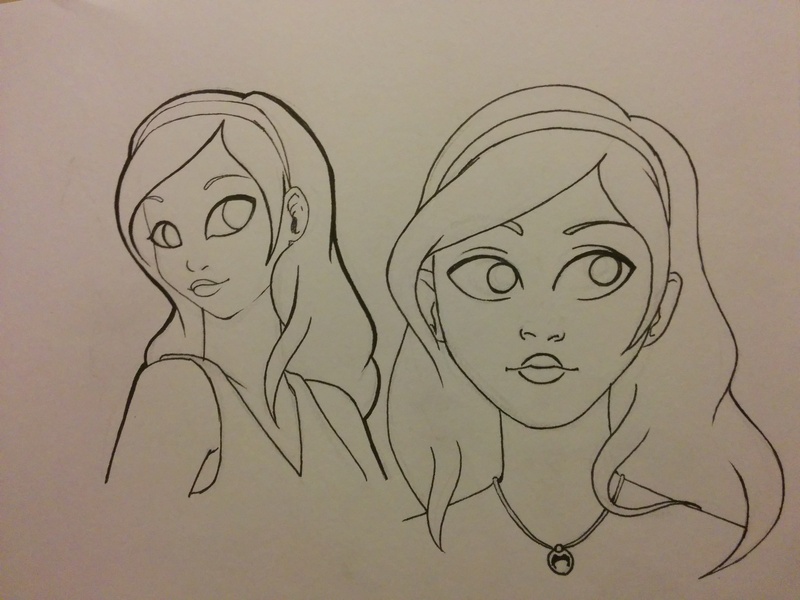 I was intrigued by her style, and made a few sketches. 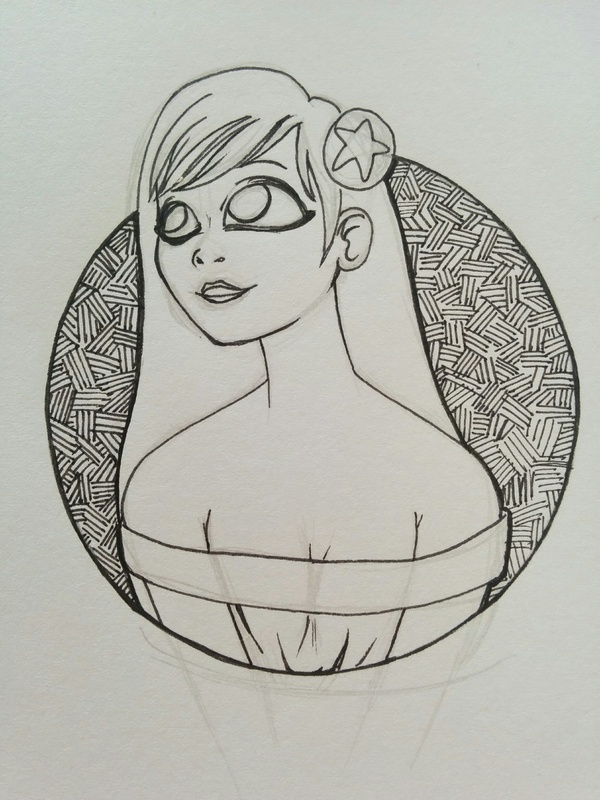 After copying a couple, I tried my own character with her style. It was a lot more simplified than what I usually try to draw, so it turned out better, I think. I learnt a lot from this study, as she does a lot of work in a three quarter front view, which I’ve always had trouble gauging how to foreshorten the back eye and where to place the iris. So, check out Genevieve Kay. I think she has an Etsy shop and sells shirt designs and small hand drawn artist cards. I was trying out some things that I saw in videos. Now that I’ve finished cleaning, I can create things again. I’m still keeping to a fair bit of drawing, though the muses in that area aren’t flowing greatly. Firstly, the CD stained glass sun catcher. 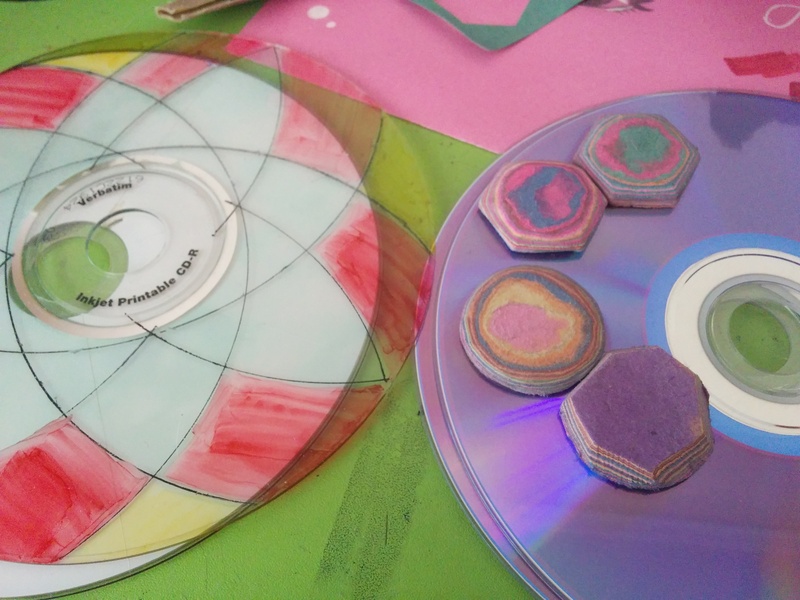 I was sent a video on Facebook about making old CDs into suncatchers by removing the laser layer to make a clear disc, use a stained glass liner, which I had, then fill in the sections with I’m assuming was alcohol ink, as it was transparent and adhered to the plastic. The first problem I had was I tried using DVDs. Apparently the backing layer on these are completely different and hard to remove, so I searched deeper, finally finding some really old CDs (you can tell the difference between them, as the CDs are greenish, whereas DVDs are more blue purple on the bottom.) I finally got a few discs clear, and marked on a design with a Sharpie. I knew I didn’t have alcohol inks in bottles, so I tried with my Copics, which is why it’s all streaky. This also caused the Sharpie to lift onto my Copics, erasing the lines I made. I haven’t even gotten to the lining stage yet, so I’ll have to have another go. I might have to search for more old CDs. The other craft that I tried is these paper stones. The video that I watched used bigger circles and put them on rings, but I just wanted to try making the gems for now. You make these by punching out a bunch of circles or shapes in different colours of construction paper. You then glue them into a pile until you get a nice size to work with. Leave these to dry, and then use sand paper to shape and reveal the coloured layers of the paper. 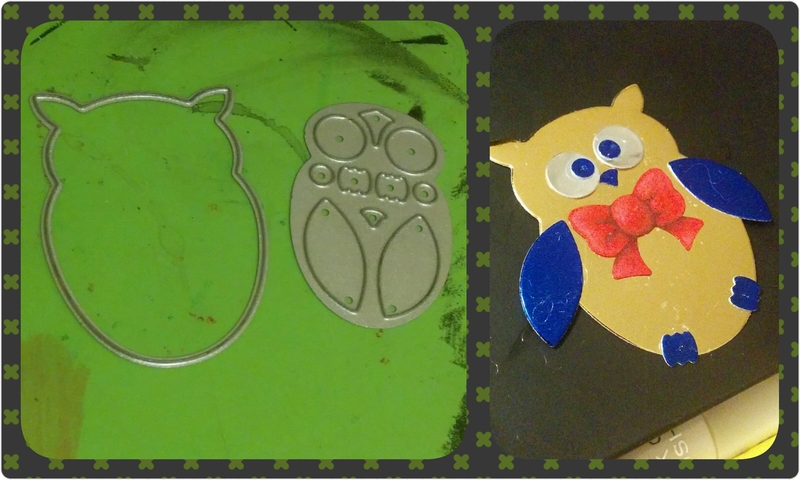 After this you seal them with sealant or nail polish, and then use strong glue to make them into jewellery. Since I only used a glue stick to adhere the layers together, I need to seal it really well, so they don’t split. By the end of these few I did, I was bored of sanding and had paper dust everywhere. They look cool and are super easy. I already have a few more ideas that I’d like to try for this. So, lately I’ve been thinking of making videos for my raspberrysheep YouTube, which hasnt been touched yet. I know I’m not a master at anything, but I’m sure there’s plenty I could teach you guys, and it has to be easier explaining in a video than written here. I have a couple of ideas, but please, ask questions and let me know what you’d like to see in the comments.